This is a ‘runseeing tour’ of Marseille. It’s possible to see many of the city’s important sites in a 4-5 mile run. There are multiple options, each starting from the grand City Hall (Hôtel de Ville), which also has a metro stop. These streets are all runnable, with good sidewalks, but some are narrow so best to go early on a busy day. We’ve replicated elements of this recommended Marseille Walking Tour. Short Run: 6.3 km/3.9 miles. 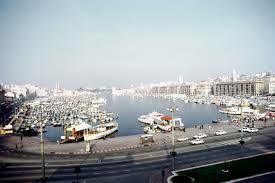 Start at Hôtel de Ville, and enjoy a jaunt along the north side of the Old Port (Qaui de Port). Then do a loop around the Mémorial des Camps de la Mort, the Église Saint-Laurent, and the landmark Museum of European and Mediterranean Civilisations, which opened in 2013. Run for about a 1.5 km (1 mile) along the port, past the Cathédrale La Major. Turn around at Place Henri Verneil and run by the baroque Vieille Charite and the Maison de la Boule. The last bit is along the streets of historic Marseille: make your way to Rue du Poirier, and Grande Rue. Long Run: 10 km/6.2 miles: Add on from the Hôtel de Ville, a run to Notre-Dame de la Garde. This adds a bit less than 4 km roundtrip and is quite hilly, but rewarding. 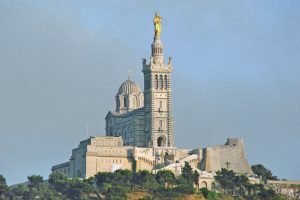 Run briefly along the south side of the Vieux-Port, then left on the Rue Fort Notre Dame, and then up the hilly Montee de l-Oratoire, to the summit, at the grand basilica at the city’s highest point, crowned by golden statue of the Virgin Mary by Lequesne. Great views! For the return, take the Montée Commandant René Valentin (stairs), and then the Boulevard Tellene, passing the medieval Abbaye Saint-Victor, ending the route with a final jaunt along the Quai de Rive Neuve. 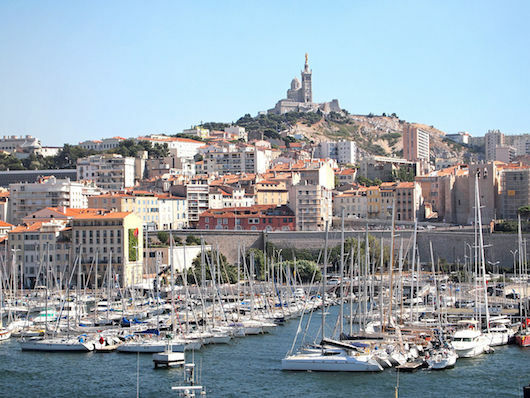 Add-On: For more Marseille sightseeing, we’ve developed a ~3 mile route of the Canebière, the main commercial center of the city, and several nearby pedestrian-only roads.